June | 2013 | Arthur in the Garden. 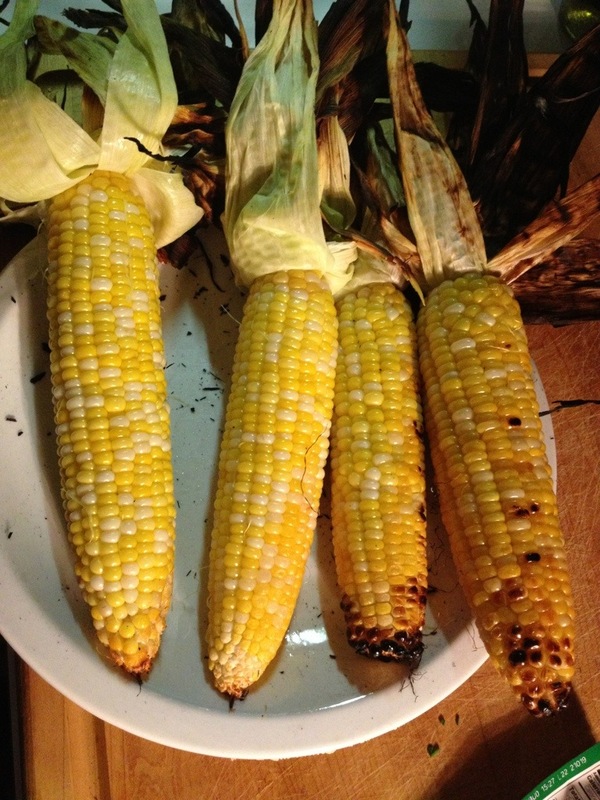 It’s amazing to think the Native Americans bred corn for a short, multi-stemmed grass which only produced a few kernels. 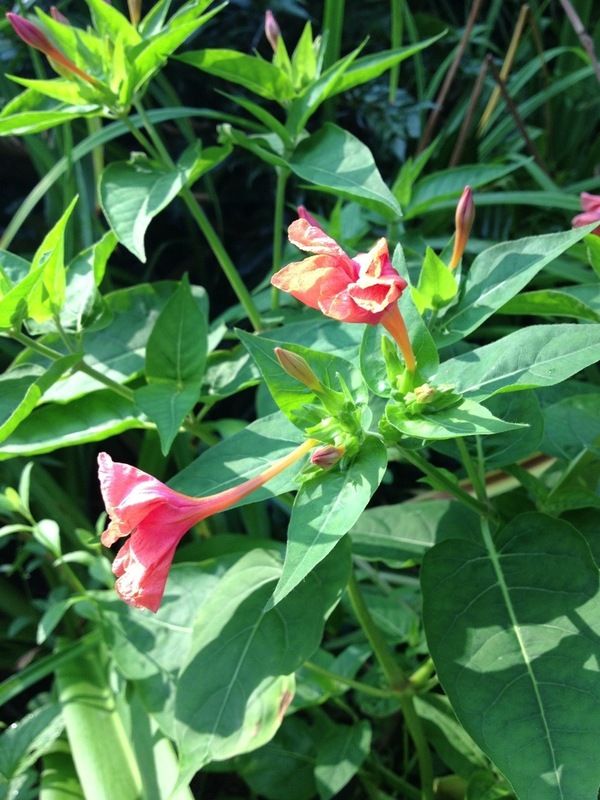 Some believe maze, as it is called outside the USA, is a hybrid of several species. None the less, it is one of the most important food crops. Not only is it used to feed humans but it is an important food source for livestock. 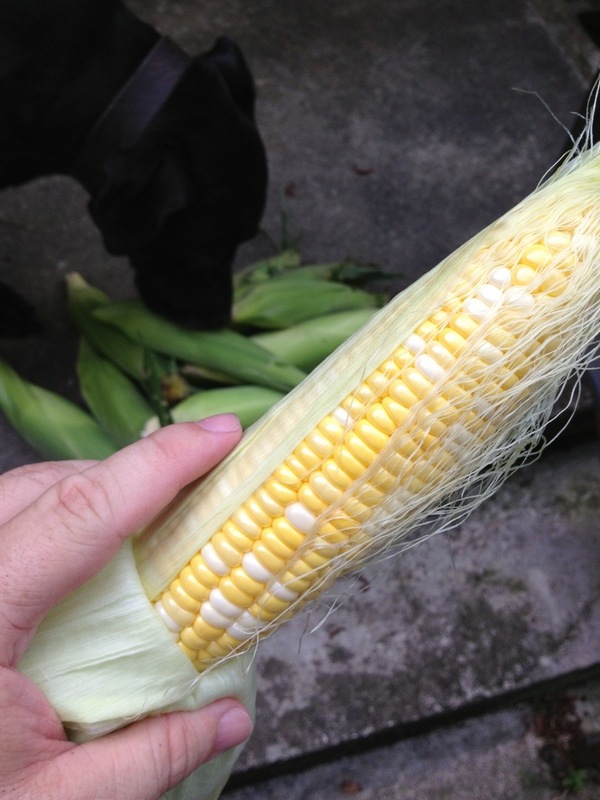 Products such as corn starch, plastics, fabrics , and adhesives are made from corn. I will mention high fructose corn syrup but will not argue its merits as sweetener and its possible effects on diabetes and other health concerns. Corn is becoming an important source of biomass, too. Ethanol made from corn is mixed with gasoline to reduce pollutants. 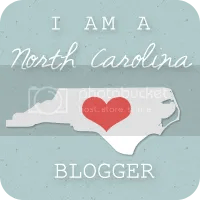 It’s corn season here in North Carolina! 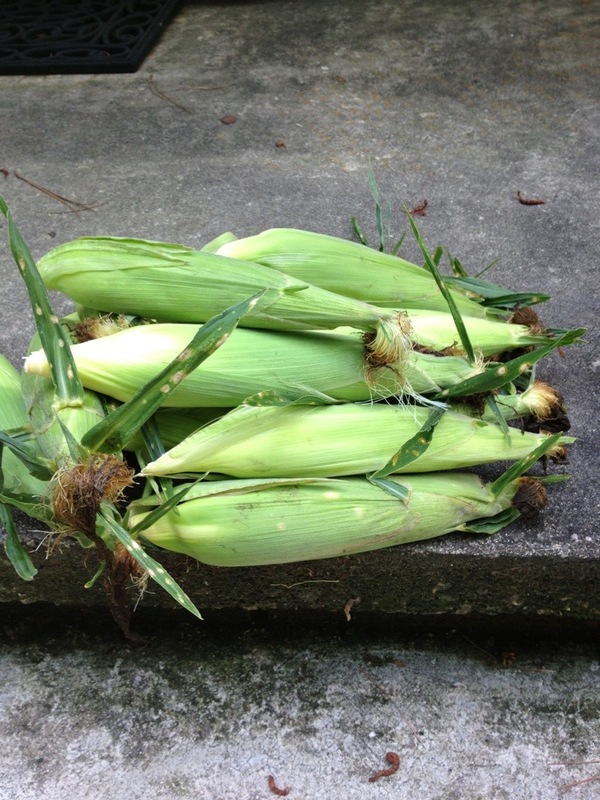 For only $5 you get this much Johnston County corn at the Farmer’s Market- 12 ears! It’s so sweet when it is fresh! Grilling only makes it better! Peel back the husk and remove the silk. 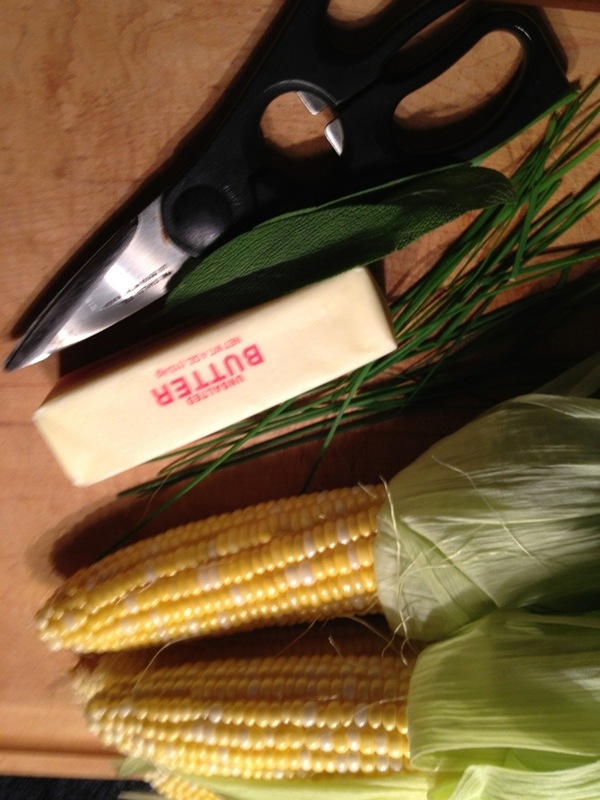 Fold the husk back over the corn. Wash if needed. Gus has to sniff everything! 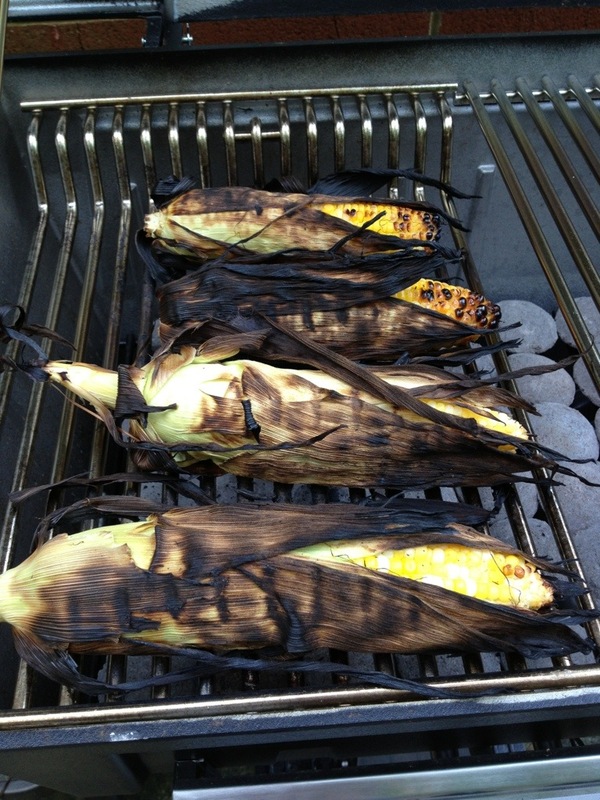 Soak the corn in a bowl of water for 20 minutes to prevent the husk from burning. Grill on a medium heat grill keeping the lid closed. Snip the herbs into the softened butter. 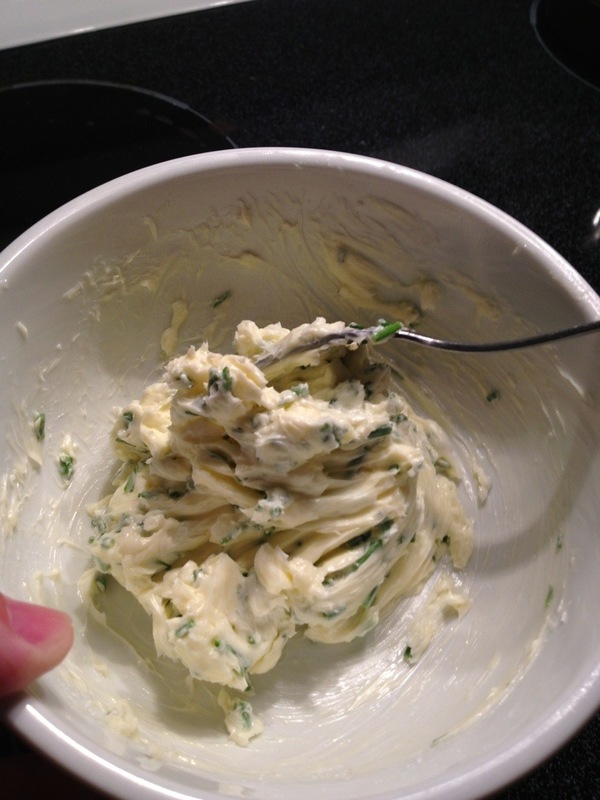 Use a fork to blend the herbs and butter. Place it in the refrigerator to harden. 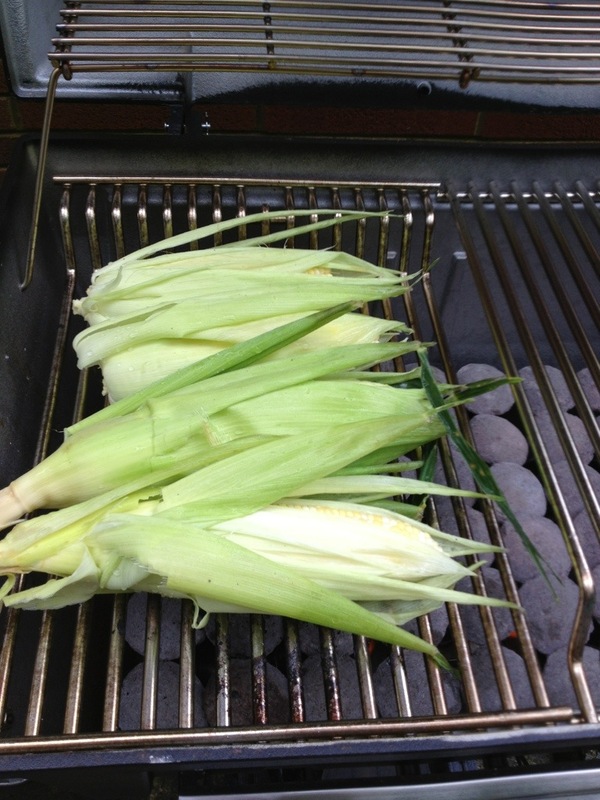 After about 15 minutes the corn will be done! Keep an eye on it to prevent a fire but try to keep the lid closed . Let it rest for about 5 minutes then peel back the husk to serve. 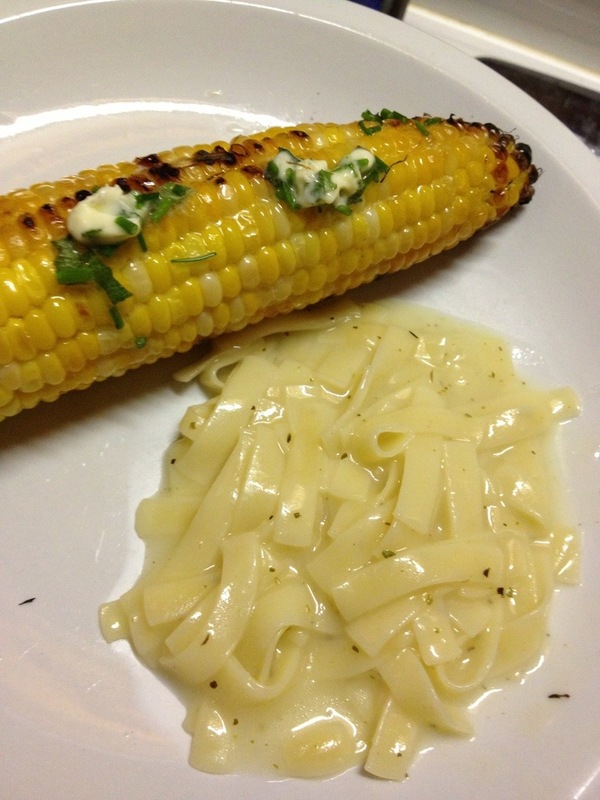 A little fettuccini Alfredo on the side and you have dinner. The summer so far had been wet and with mild temperatures. When I say mild I mean our temperatures are usually in the 90s by now with 100% humidity. They have only been in the upper 80s so far this season. 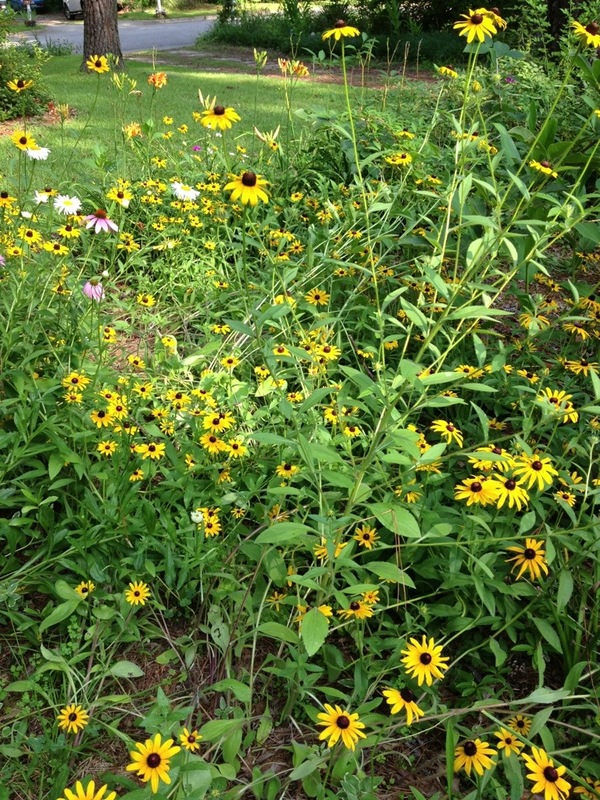 The black-eye Susan which were blown down by the tropical storm last month are blooming and beautiful even though they are no longer standing upright. The goldfinches and other birds will appreciate the seeds in the fall. The entire huge boarder of wildflowers which I have developed between the lawn and front walk has really come together the past few seasons. Some of my favorite plants bloom this time of the year. 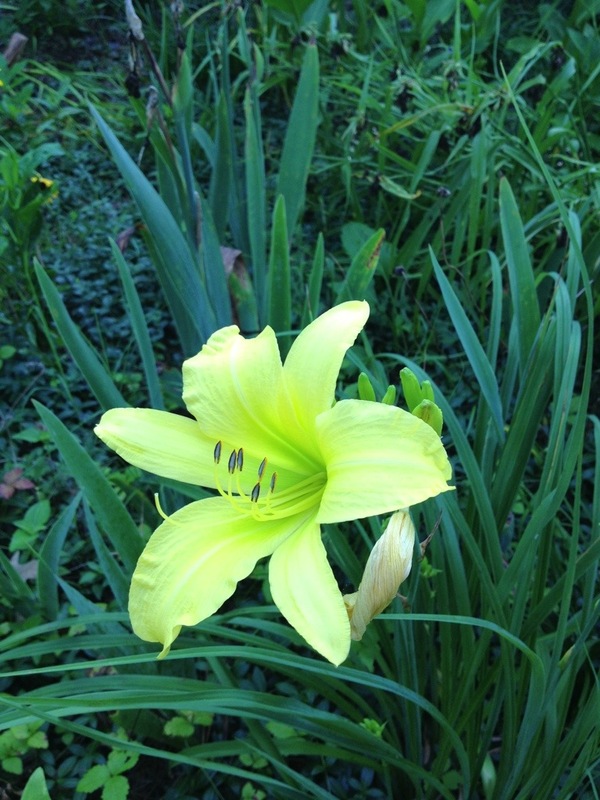 Hyperion daylily- the pale yellow flowers are fragrant and the leaves are semi-evergreen. It’s unusual for that in midsummer, after blooming, it dies back to the roots then comes back in the Fall once the weather cools and persist as a mound of leaves throughout the Winter. Four-o-clock: this apricot colored plant came from a pack of mixed seeds. They open in the afternoon and stay open all night for the moths. 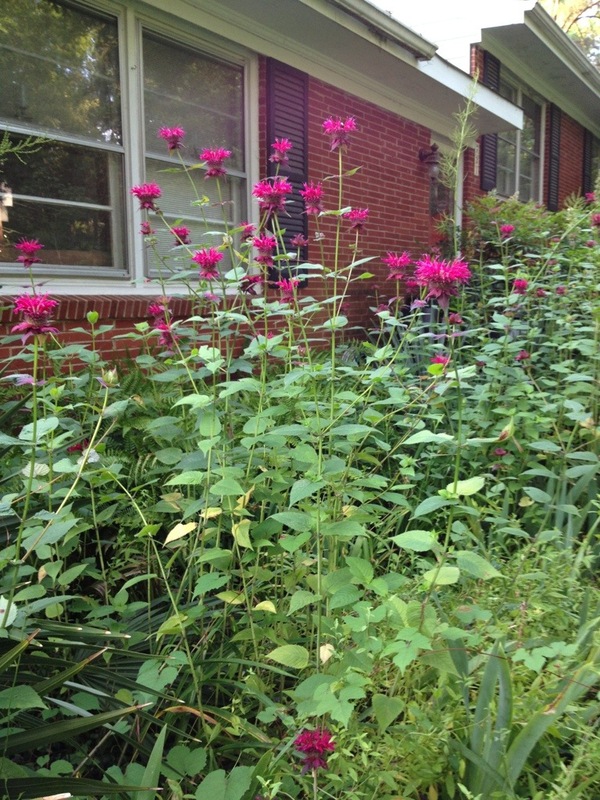 Here in Raleigh they are perennial and will multiply by dropping seeds. 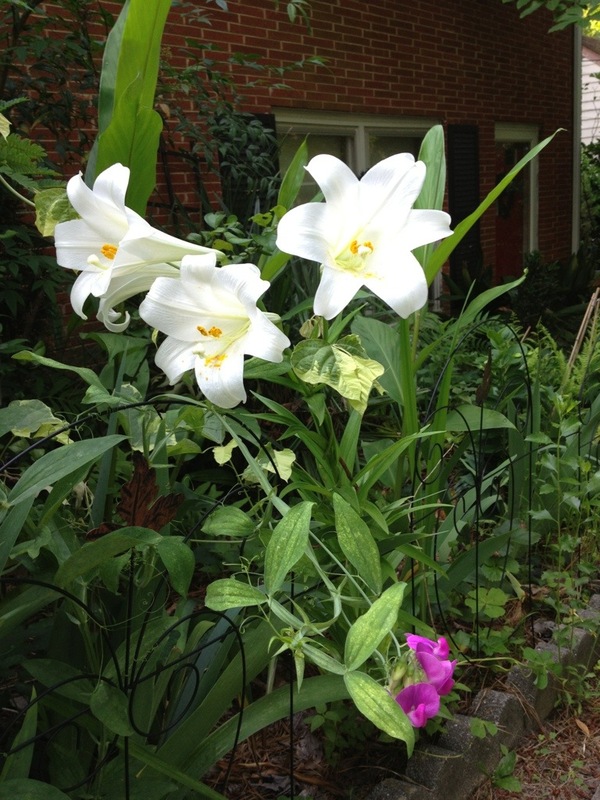 Lilies: I purchased a bag of mixed lilies years ago and there are some unusual colors. I have had problems with voles eating the bulbs over the years so most are gone. Lately, a black snake has taken up residence in the garden and is keeping the vole population under control so the lilies are blooming this year. 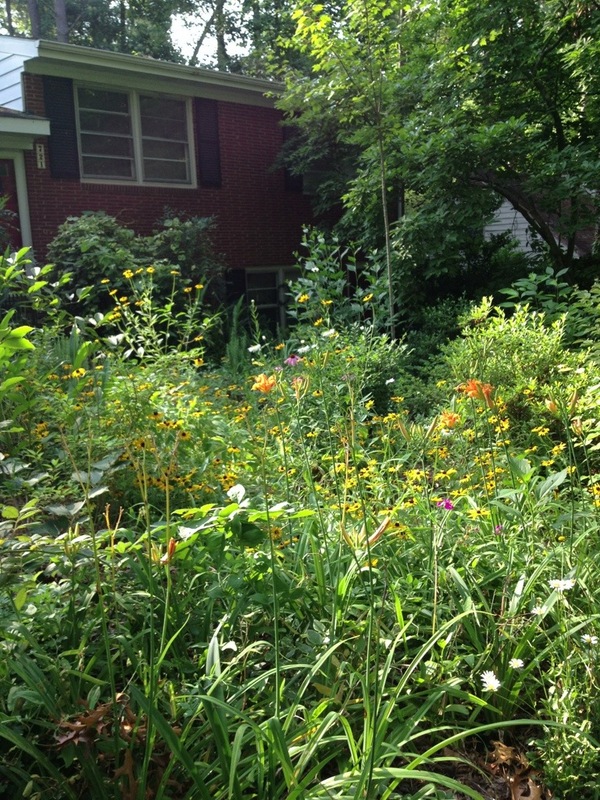 I am eager for the tiger lilies to bloom later in the summer for the first time in years. They are my favorite. 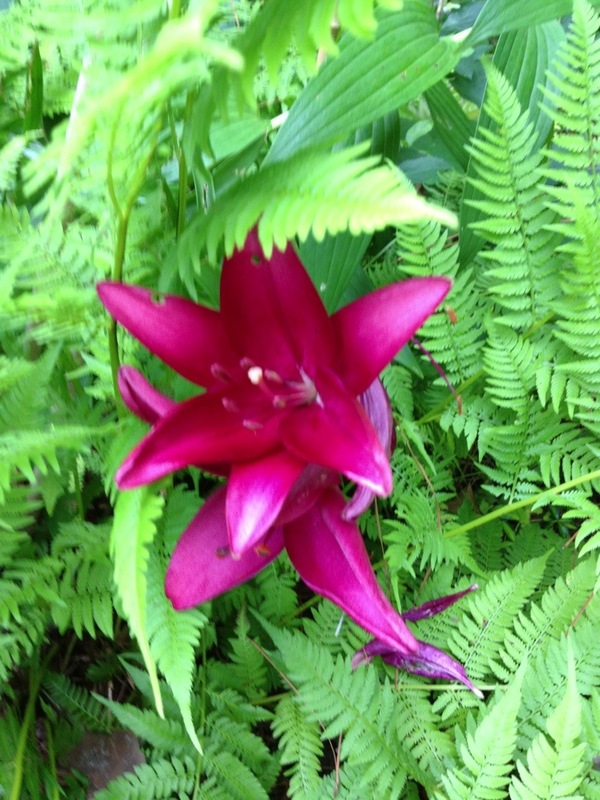 This Asiatic lily below is an unusual color. And I take all the Easter lilies people want to give me when they are finished with them after the Easter holiday. When they come back the next season they bloom at a more typical lily season in June. 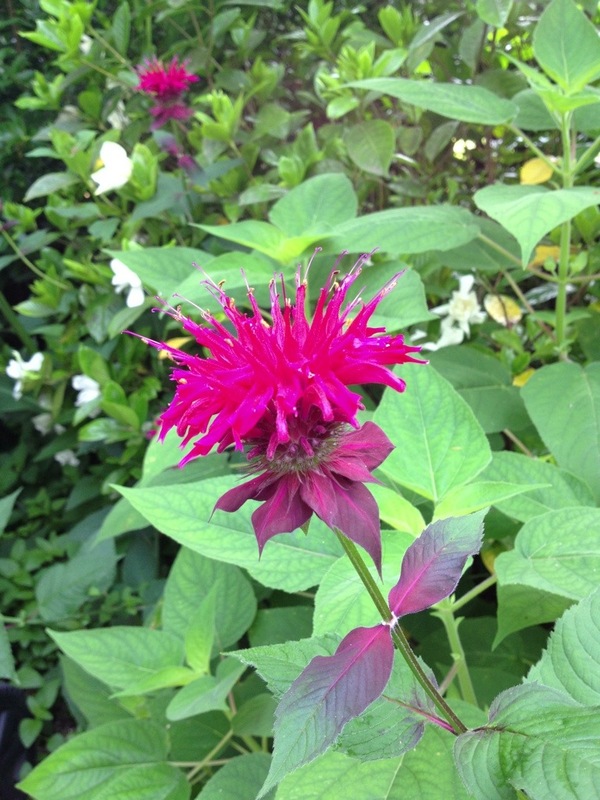 Monarda “Jacob Cline” has been a real trooper! It is suppose to stay a compact three feet or so but I have several patches around the garden and the one along the front walk reaches five feet tall! 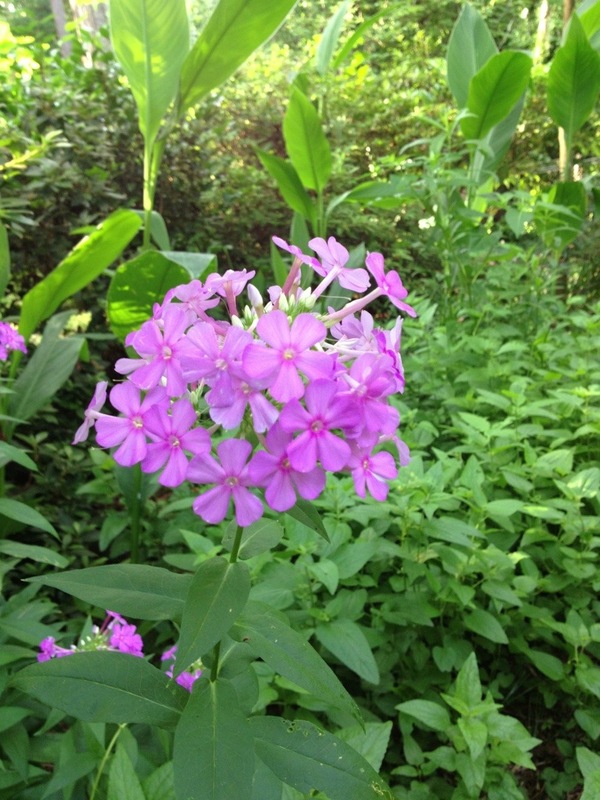 There are a few patches of woodland phlox around the garden, too. 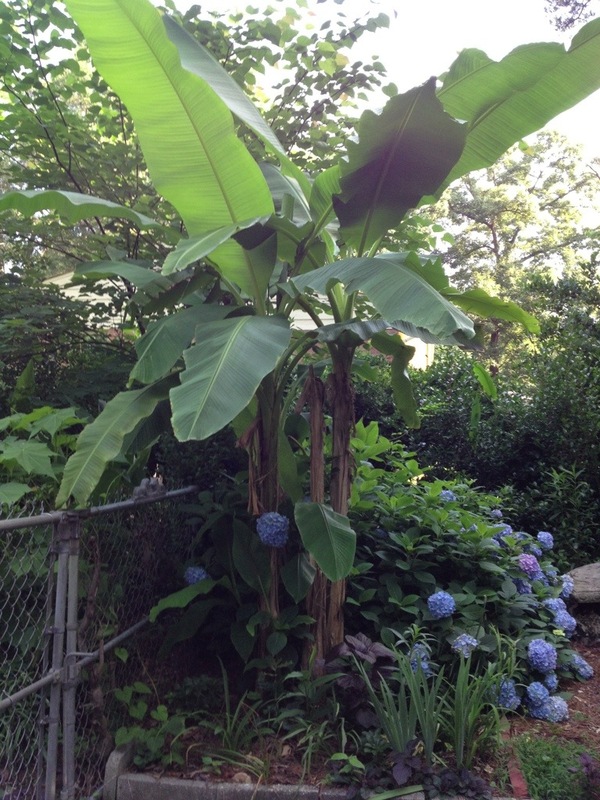 There are also several clumps of bananas around the garden. The most robust is the Basjoo near the patio. 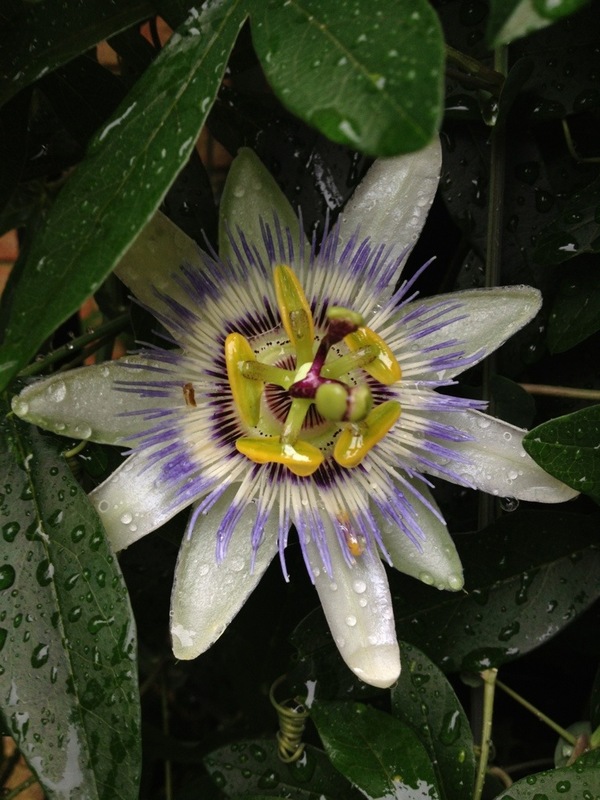 One of my favorite flowering vines is the common passionflower. It can be aggressive if not trimmed regularly and will sucker. You just have to keep an eye on it like a mischievous child! 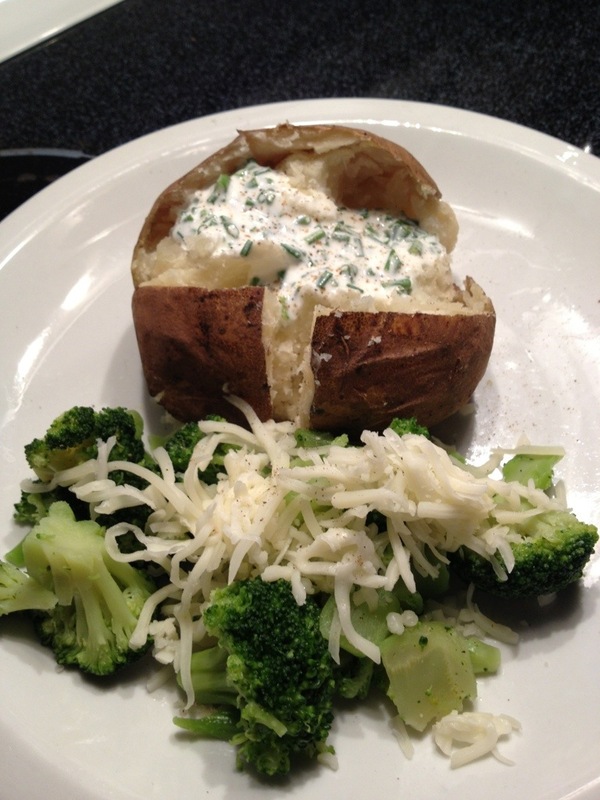 Homemade chives and sour cream dip on a baked potato with steamed broccoli and cheese. Sometimes a baked potato is very bla and not very tasty even with salt, pepper, and butter. 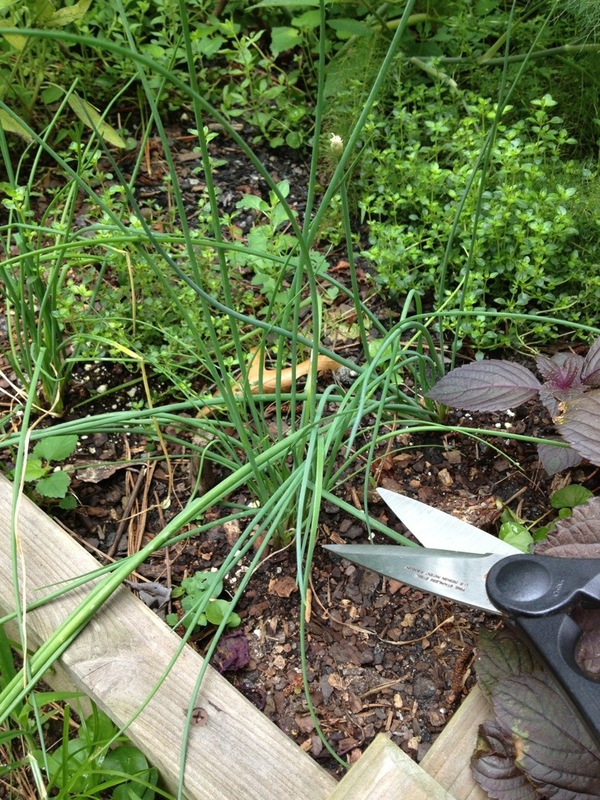 I’ve just added some new chives plants to the vegetable garden and they needed a trim. Of course, there was all ready sour cream in the fridge so it was a natural combination! I used kitchen scissors to harvest the chives. 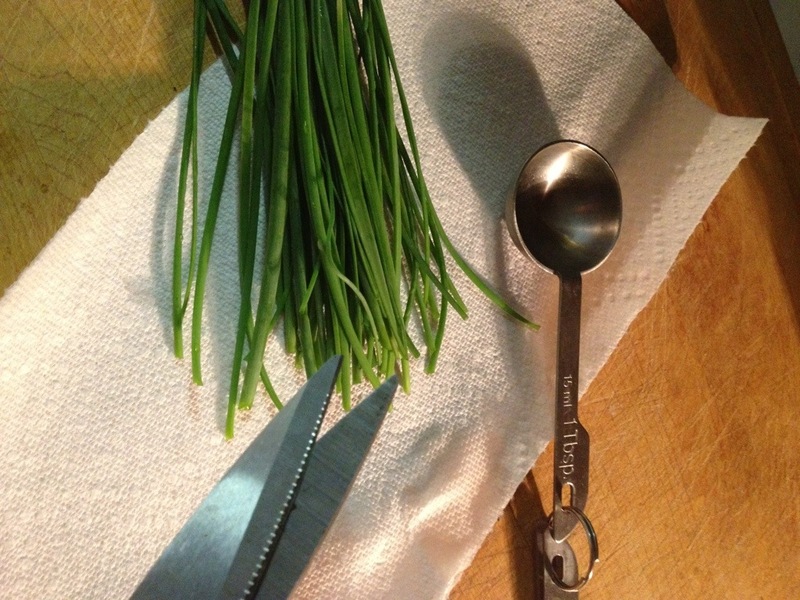 4 tablespoons fresh chives – cut into small pieces with scissors. Mix the ingredients and serve. Chill to keep firm. Preheat the oven on 425f. 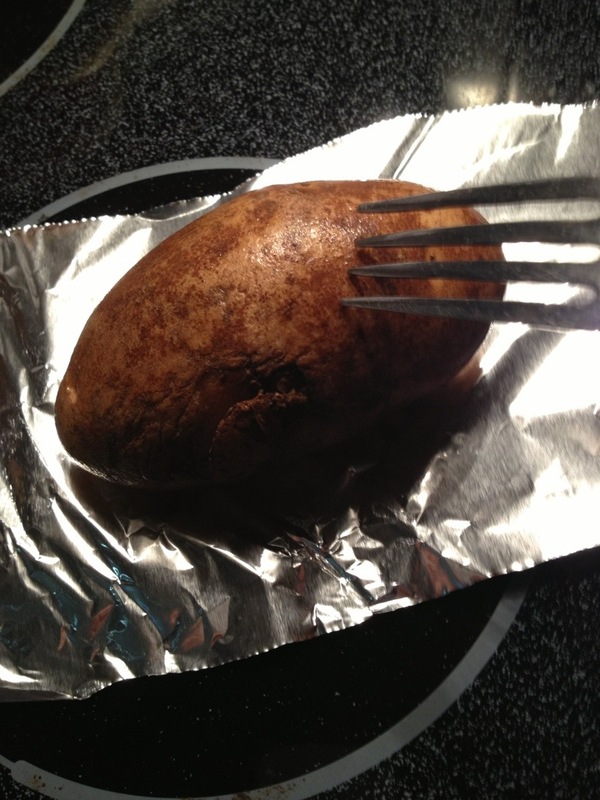 Using a fork, pole holes around the potato. You may rub them with olive oil and salt and pepper. Wrap in aluminum foil. Place on lower rack of oven. The aluminum foil produces a moist skinned, baked potato. Bake for about 45 minutes to one hour or until cooked through. You can test for doneness by poking it with a fork or pinching the potato. Its it is soft its ready! 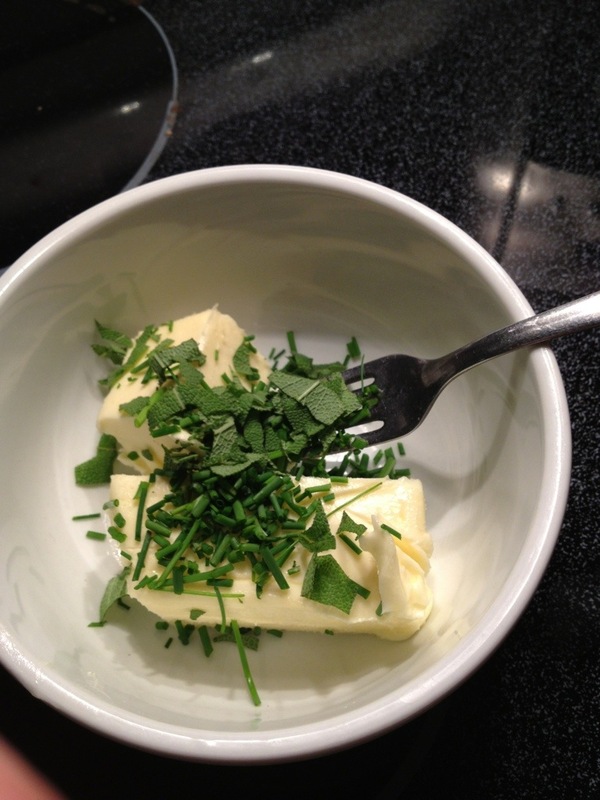 Top with the chive sour cream dip and more chives, salt and pepper. I also steamed broccoli in the microwave for about five minutes and sprinkled with cheese while hot.